Post news Report RSS	News : A small demo, Steam, and Linux! 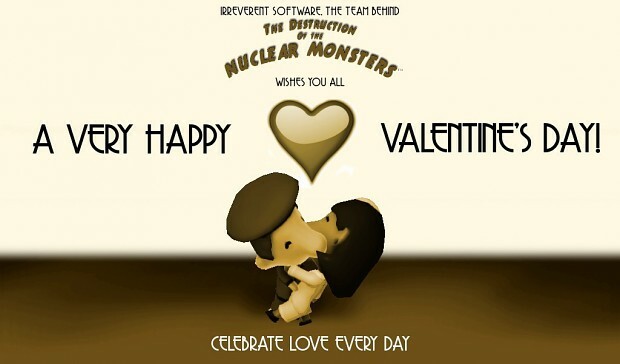 In this article we will cover some news about the development of The Destruction of the Nuclear Monsters, the new interactive tests we released, and to announce that the game will also be available on Linux. This is just a short article with some interesting news. During the last few days, we have been working on several things, but let's start by wishing you all a Happy Valentine's Day. Remember to spread some love through all the people dear to you, and with everyone you meet! We are very proud to announce that our game is starting now the process of Steam Greenlight, right now as an early project. It will help us a lot to improve the game and to develop it if you can share it with your friends, give it a like, or give us your feedback. Processor : Intel Dual Core 1.86 Ghz. OS : Ubuntu 14.04 or above, Windows XP or above. Processor : AMD Radeon A4 3300M, two cores at 2.1Ghz. VRAM : AMD Radeon 6480G (Crossfire setup) with 1.4Gb in VRAM and full pixel shader 5.0 (DirectX11) support. OS : Ubuntu 14.04 or above, Windows 7 64 bits or above. After much testing and several builds, we are finally satisfied with the results we got in our Linux machine (Ubuntu 14.04), and with this success, we decided to officially develop and release the full game both in Windows and Linux. We are confident that this will help us reach even more players, and will help more people to enjoy the final game. The look of the game, performance and features will be exactly the same across systems, so everyone can have the same experience. If you have a Linux machine, please remember to try the Linux demo so we can start tracking compatibility across different versions of the system. Right now, only Ubuntu 14.04 has been tested, but we are confident that it will run without troubles in most versions of the system.